/ Best Taco in Destin FL / TACO TUESDAY ROCK’N BINGO@7PM! 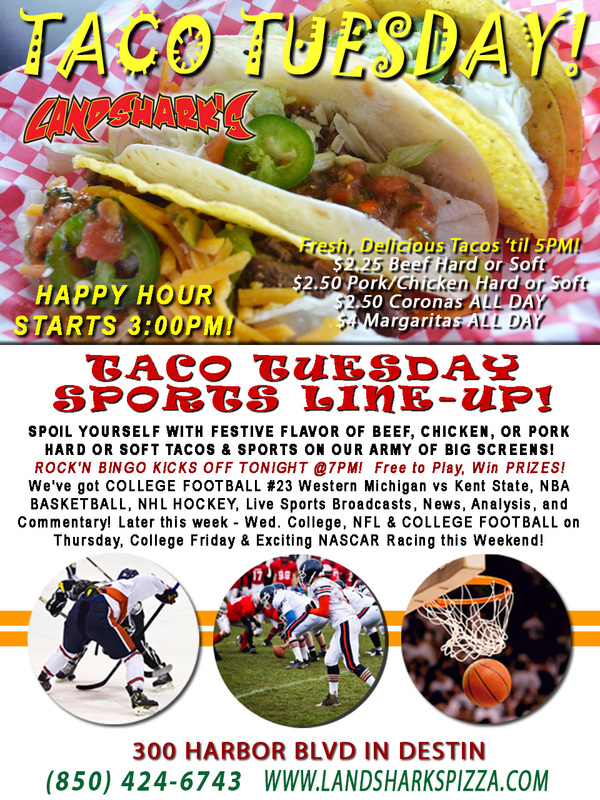 $2.50 CORONAS & $4 MARGARITAS, College Football & 3PM Happy Hour! TACO TUESDAY ROCK’N BINGO@7PM! 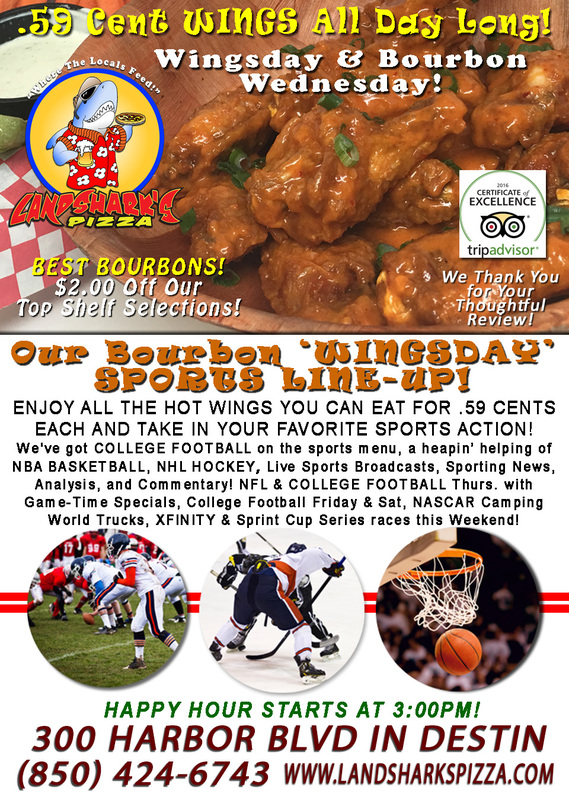 $2.50 CORONAS & $4 MARGARITAS, College Football & 3PM Happy Hour! HARD AND SOFT CUSTOM-BUILT YOUR WAY, get full for less with $2.25 BEEF, $2.50 PORK OR CHICKEN (dine-in ’til 5pm with regular drink purchase). Also featuring $2.50 Coronas & $4 House Margaritas go all day long! ROCK’N BINGO CRANKIN’ UP THE GOOD TIMES TODAY AT 7PM! Great music, a ton of bingo fun that brings a smile and a cheer as you rack up the wins. Classic Rock, 80’s, 90’s, and 2000’s Music Rounds, FREE TO PLAY, & WIN FREE PRIZES! Get energized, get some fun in your day at Landshark’s with ROCK’N BINGO! 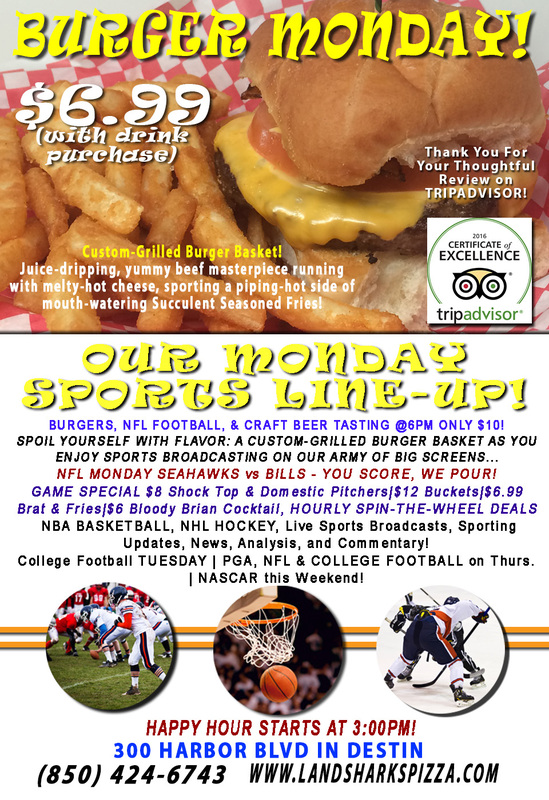 SPORTS ON OUR ARMY OF BIG SCREENS – We’ve got COLLEGE FOOTBALL #23 Western Michigan vs Ball State, NBA Basketball, NHL Hockey, plus plenty of other Sports Broadcasts, Sporting News, Analysis, and Commentary! Oh, the grandeur and style of our FULL ONLINE MENU – access by simply using your Mobile Phone when you go to our website or on Facebook using the ‘Menu App’ on the left hand side under Apps. ENJOY A FULL SELECTION OF ADULT BEVERAGES & COCKTAILS – from Top Shelf Bourbons, Whiskeys & Vodkas, Scotch’s & Gins, Tequila’s & more to our Jester Series Daquiries & Margaritas. Local & Regional Brewery Beer selections, Domestic & Imports, and Wines. Previous Post: « NFL FOOTBALL SEAHAWKS vs BILLS, YOU SCORE, WE POUR! $6.99 Burgers & Brats & CRAFT BEER TASTING @6PM!